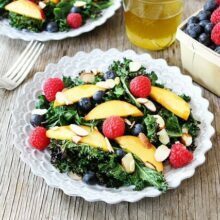 This simple Grilled Kale Salad with Berries and Nectarines is not only gorgeous, but healthy and delicious too! Josh and I both work from home which means we see a lot of each other. We often get asked if we get sick of each other, but luckily we enjoy spending time together. I’m not going to lie, sometimes I go downstairs to get some space, but only for an hour or so:) We really do love working together. Plus, Caleb is the cutest little assistant. He is a distracting assistant, but we are lucky we both get to spend so much time with him. When Caleb goes down for his nap, Josh and I rush to get as much work done as we can. We rarely sit down and eat lunch together because we are both wrapped up in our work. This week we put Caleb down and I asked Josh to join me for lunch. He agreed, so I made a Grilled Kale Salad with Berries and Nectarines and we both put our work aside. I was a little worried Josh wouldn’t join me for lunch once he found out what was on the menu. Josh loves kale and salads, but not as his meal. He thinks they are sides:) Luckily, Josh humored me and showed up for our lunch date:) He even helped grill the kale. Have you ever grilled kale? If you haven’t, you are missing out and if you have, then you know how amazing it is! The grill brings out the best in kale. Grilling kale is simple. I made a simple dressing made of olive oil, white balsamic vinegar, agave, and lemon juice. I brushed the kale leaves with the dressing and gave them to Josh to put on the grill. Josh grilled the kale for a few minutes, it doesn’t take long for the kale leaves to get charred and crispy! I could have eaten the entire tray of grilled kale. It is soooo good! I drizzled our salads with a little more dressing. The salads were gorgeous, almost too pretty to eat! Josh and I ate outside on the patio while our little pea snored away.It was nice to enjoy a healthy lunch with my husband, not my co-worker, but my husband. It was nice to take a break from work. The Grilled Kale Salad was amazing. 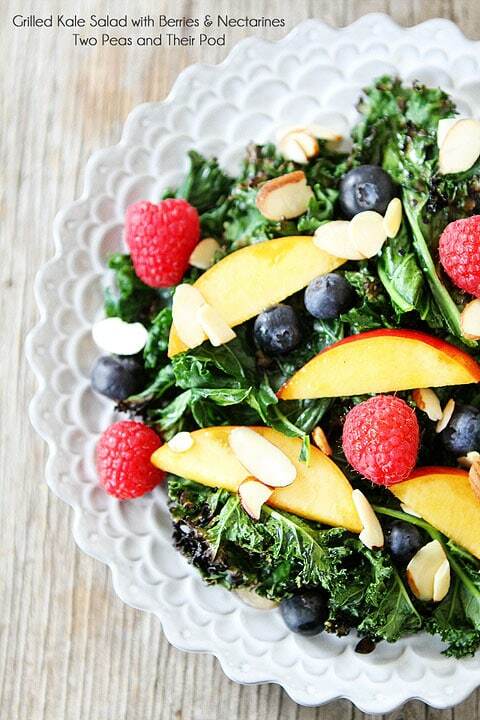 I loved the smoky crisp kale paired with the sweet berries and crunchy almonds. Josh added feta cheese to his salad and devoured it. I guess kale salads are ok as the main meal. He loved it! 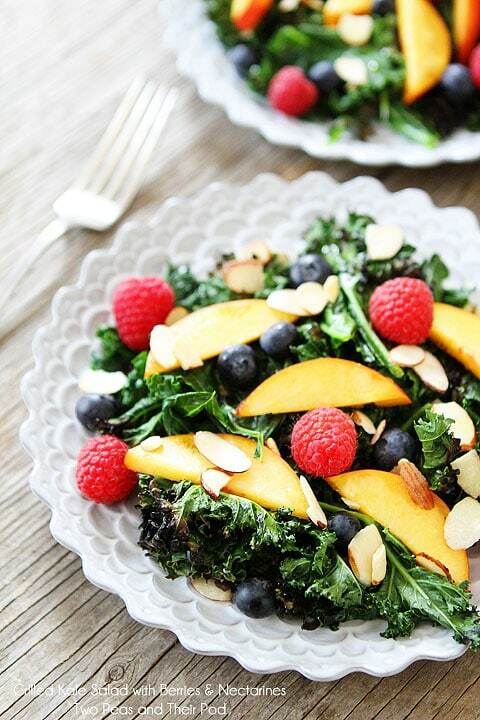 Fire up your grill and make a Grilled Kale Salad with Berries and Nectarines. It is a great salad for lunch, dinner, or as a summer side! Enjoy! 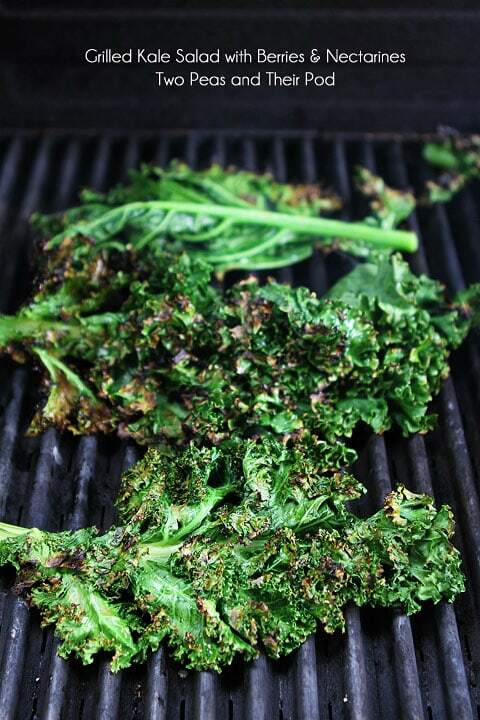 Grilling kale makes it crispy with a slight smoky flavor. 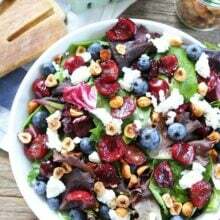 Top with berries, nectarines, and almonds for a healthy, gorgeous, and delicious summer salad. 1. Wash the kale and set aside. In a small bowl, whisk together the olive oil, white balsamic vinegar, agave or honey, lemon juice, salt, and pepper. Liberally brush the kale leaves with the dressing, using about 2 tablespoons. 2. Heat the grill to high heat. Grill kale, turning once, until crispy and charred at edges, about 2-3 minutes. Let the kale cool to room temperature. Remove large center stems with a knife and discard. Roughly chop the kale leaves. 3. Place kale leaves in a large bowl. Add the nectarines, blueberries, raspberries, and almonds. Drizzle salad with additional dressing. Toss and serve. Crispy kale is one of my favorite ways to eat the leafy green and happy to see Josh at work at the grill too :). And your photos are as pretty as a picture! What a great idea, I love that you grilled the kale. Perfect for the summer!! Have a great weekend! This looks like a great dish! 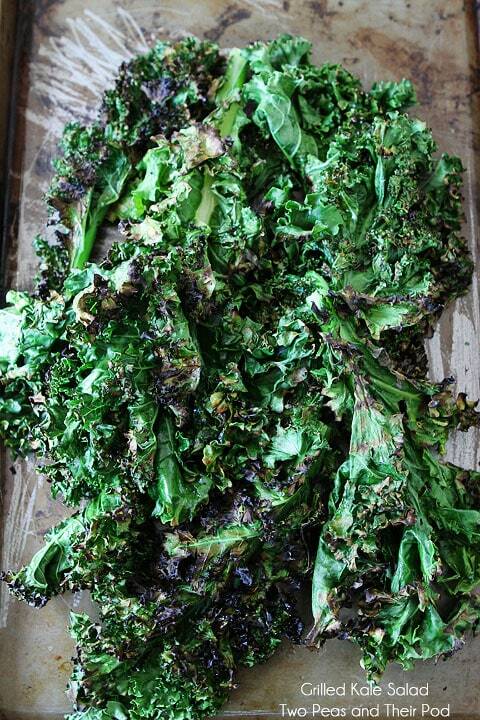 I have just discovered I like homemade kale chips so I bet this would be a winner for me! This looks like THE summer salad – love how colourful it is! Love this! 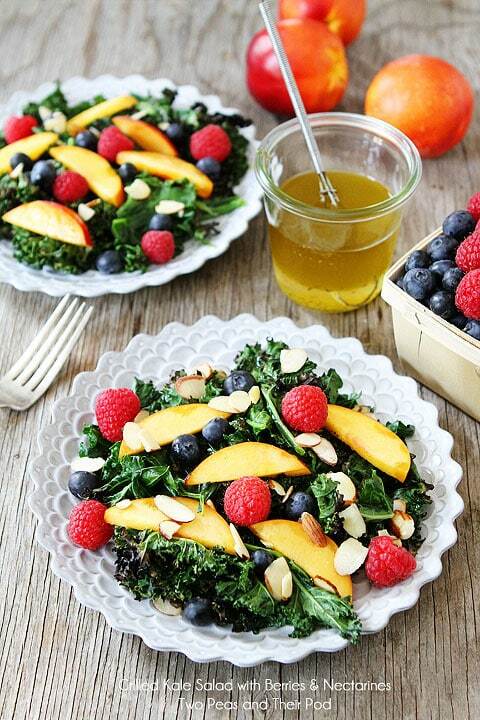 Beautiful salad and I love kale! Such a vibrant, pretty & healthy salad! Have a great weekend! That looks so beautiful! Almost too beautiful to eat. Maybe you’ll turn me into a nectarine lover after all. This is gorgeous!! I love the grilled kale!! Such a prefect, fresh summertime salad. Must make this one! Love that you guys made time for a lunch date at home. So cute!! This salad is absolutely gorgeous!! I’d take one for lunch any day!! Lovely salad, Maria! Love the idea of grilling the kale! Such a colorful salad and healthy one. Never occured to me to grill kale! LOVE it thought! Yumm. Grilled kale? This looks like a delicious summertime salad Maria! 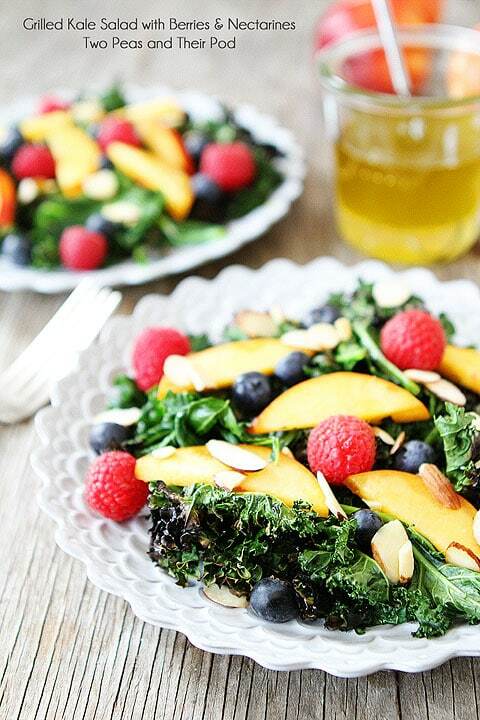 I can only imagine how awesome grilled kale is with this salad!! It looks wonderful! 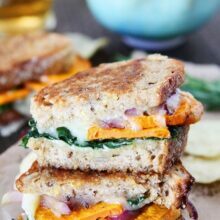 I have never grilled Kale, but since I am in the middle of learning to love it, I will try it this way too! The nectarines are gorgeous! I’ve been working on bringing salads into our diet as more of a main meal (we both tend to see them as sides usually too!) and this one looks way too good not to try! We also, coincidentally, just bought a grill 2 weeks ago so this will be perfect to try out! This salad does look gorgeous! I’ve honestly never cooked with peaches, but this is good motivation to start, thanks! 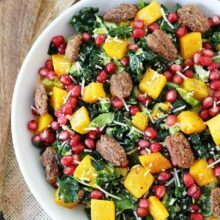 This is such a wholesome, colorful and super flavorful salad, Maria! I love it! What a delicious looking salad. I will grill pretty much anything, but I’ve never thought to grill kale. I will try it. I love the sound of your dressing, too! these photographs are insanely gorgeous – oh, and those beautiful plates… love! this recipe looks simply incredible. i’m obsessed with all that fresh fruit – yum! SO going to try this!! Love this idea! We had grilled romaine salads with dinner tonight and I was saying how we need to use grilled kale next time. 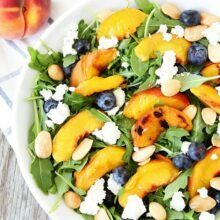 This salad looks so refreshing and delicious! I love Kale but have never grilled it. Beautiful photos! 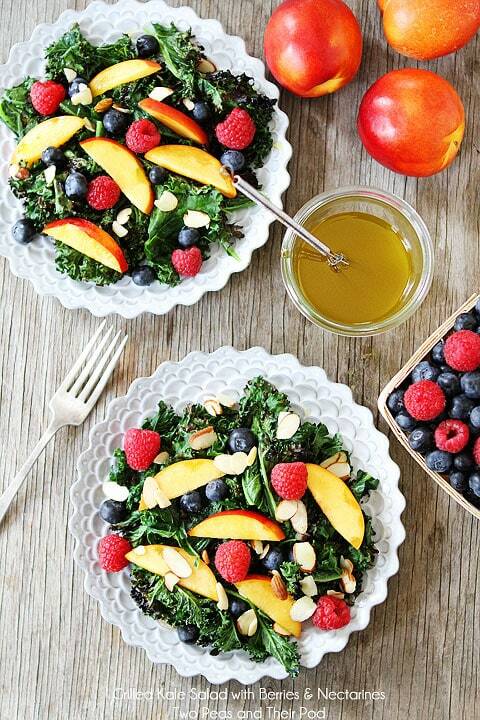 Can’t go wrong with grilled crispy kale topped with colorful summer fruits. Oh my yum! And I LOVE this salad. 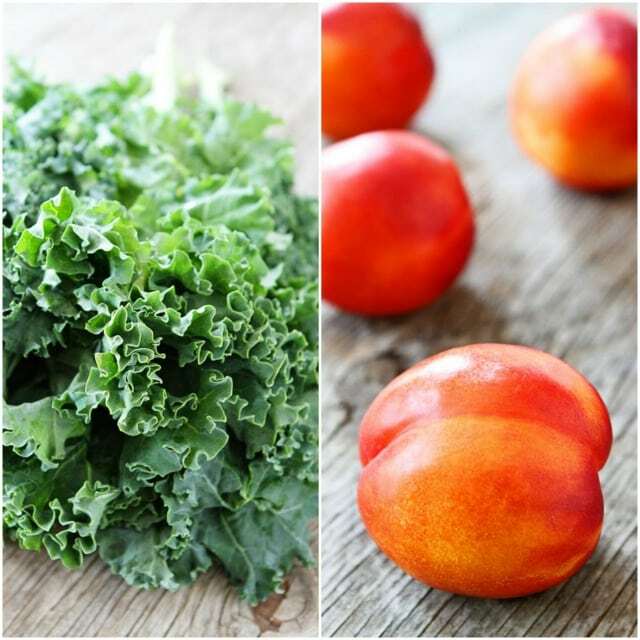 I’m all about kale in my salads, and the fruity inclusion is just so summery! This looks so pretty, and the thought of a mid day lunch date with your spouse sounds just wonderful. Nicely written! This looks delicious! I’ve never had kale but this makes me want to try it! I have kale coming out of my ears since I misread how to plant it while planting it in my garden this spring. Not that I am complaining though I luff kale. And I think this is the perfect way to use some of it up. So pretty!